The CyclePump tire inflator is rugged enough that British Army patrols used it for their scout cars deployed in Iraq. Photo taken on the streets of Baghdad. BestRest offers adventure gear that's rugged and reliable - gear you can trust. Owner David Petersen designs and fabricates most of the products shown on the website. He rides the BMW F8GS and R12GS and he's not afraid to get them dirty. BestRest's most popular products include the CyclePump Tire Inflator, the EZAir Tire Gauge, and the TireIron BeadBrakR. You'll need them when you have a flat tire, when you're adjusting pressure for maximum traction, and when it's time to change tires. BestRest also has a line of hard parts, soft luggage, and gear for the adventure rider. The CyclePump is the Official tire inflator at RawHyde Adventures. Just ask the Staff - they all carry one because they know it'll perform when the going gets tough. When you need air in your tires, you can count on the CyclePump. 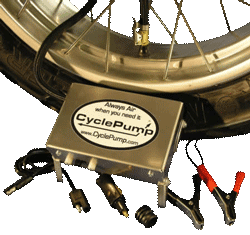 The CyclePump is the Gold Standard of motorcycle tire inflators. It has a proven record of performance and reliability, which is why it was chosen as the Official Tire Inflator at RawHyde Adventures. All the Staff Members carry one whenever they ride. The CyclePump gives you the ability to fill a tire in the field after making an emergency repair, or you can use it to air-up tires after a low pressure ride in the dirt. The hardened aluminum case and other components easily stand up to the rigors of off road riding. 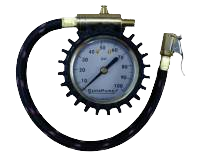 The Gauge can be used all by itself, or as an in-line gauge connected to the CyclePump. You can easily monitor pressures as the tire fills. The bleed button on top lets you drop pressures for a ride in the dirt. When you hit pavement again use the EZAir and the CyclePump to restore full highway pressure. The TireIron BeadBrakR kit gives you everything you need to change or repair your own tires, anywhere, anytime. Three tire irons assemble into a bead breaker, which easily separates the tire from the rim. Those irons are then used to remove the tire for repair or replacement. With a BeadBrakR you'll be able to change both tires in just a few minutes and you'll avoid costly visits to the tire shop. The kit includes tire irons, assembly components, rim protectors, tire mounting lube, and a valve stem tool. If you want to learn how to make repairs in the field, this DVD is for you. 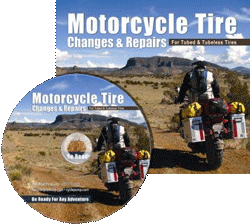 It covers most types of repairs on both tubed and tubeless tires, and it also shows you how to change your own tires using nothing more than a few tire irons. BestRest sells more than just tire related products. We also sell soft luggage, Metal Mule panniers, a wide range of hard parts for the BMW F800GS and R1200GS, and other motorcycle adventure gear.